9812 - 10" Wide High Capacity Pre-sloped Fiberglass Trench - Jay R. Smith MFG Co.
Jay R. Smith Mfg. Co. Drainage Systems now provides the industry with a precision engineered solution for high capacity drainage requirements. The 9812 System combines high strength, corrosion resistant polyester (tan) or vinylester (gray) fiberglass with an innovative design. Channels have an 8” internal width with the additional feature of a built-in slope of 1.0%. These features promote quick evacuation of large volumes of standing or surface liquids. The wider interior width allows not only for increased hydraulic capacity but also for an efficient means of handling solids. The system’s twelve sloped channels are each nine feet in length and channel depth varies from 6.88 to 20.25 inches. Four neutral nine foot channels and four neutral three foot channels are available to lengthen the system. The lightweight channel design of the 9812 System allows for exceptionally rapid installation. The heaviest nine foot channel and grate frame assembly is easily handled since it weighs only 81 pounds. Prior to installation, each channel is fitted with a frame using fourteen plastic push pins. The 9812 frame is equipped with concrete anchors (one pair per every 18 inches). Frames are available in 3 or 9 foot lengths, allowing channel units to be installed in these lengths. Cast iron slotted grating is recommended for heavy duty pneumatic tire traffic and ductile iron slotted grating is recommended for extra heavy duty solid tire traffic applications. These 18 inch grates are securely locked to the sturdy grate frame with two stainless steel 1/2” bolts. For lighter duty applications, galvanized or stainless steel bar grating can be provided based on mechanical or chemical requirements. These three foot grates are locked down to the frame with four socket head bolts per grate. 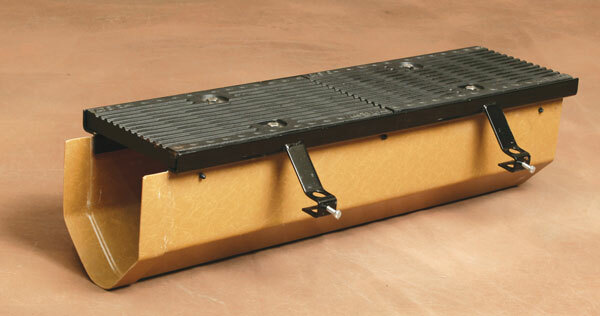 For extreme chemical conditions, vinylester fiberglass bar grating is available in three foot lengths. Accessory components include catch basins, universal end caps, universal outlet caps, 4”, 6” and 8” bottom outlets to provide a high degree of flexibility when designing the system. Custom outlets are available upon customer request. The 9812 Catch Basin comes with coated steel frame and ductile iron grate. These basins may be used with any channel section to serve as an outlet point for the trench system. Knockouts to accept trench inlets are easily fabricated in the catch basin walls on the job site. 9' Foot Long High Capacity Polyester Fiberglass Channel with Sloped Radius Bottom Surface with Male/ Female Connections Providing a High Integrity Lap Joint. Duco Coated Welded Steel Frame Support System with Concrete Anchors (One Pair Every 18 Inches). Supplied with Secured Grate Per Your Specification. Bottom Outlet - 4, 6, 8"